Kanfanar is a peaceful little town - all open-plan greenery and space - complete with delightful church and steeple. Very near the centre, but not crowded out by other houses, is this two floor detached corner property. The illuminated garden, wafted by the scent of various grasses, lavender and rosemary, just begs to be used, day or night. Inside, this light and airy house is rustic with classically functional furniture. 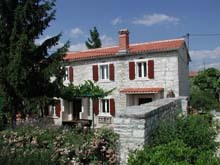 Rural House Ana is offering you a sense of rest in a old Istrian house built in 1905. 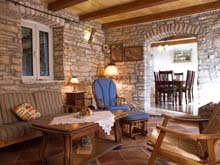 Today, renewed and decorated in the true Istrian style, this house gives a complete comfort to its guests. The garden decorated with the host�s special affection, barbecue corner for gourmans in the spacious back yard covered with wine grapes makes one�s sense complete. Bathroom, kitchen and living-room on the ground floor of the house have a separate entrance. On the first floor there are two comfortable rooms with five beds. There is a French bed in one of the rooms, while there are three beds with a separate bathroom in the other. 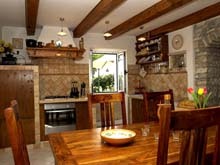 Every room has heating and there is all necessary aparatus for the whole year�s stay at your service. Prices are in Euro for minimum 3 days. The rent of the house includes cooking inventory, electricity, gas and water spending and final cleaning.